In the wake of the low turnout to a Sept. 20 protest in Moscow, sources polled by RBTH say that the protest did not appear convincing and conclude that for the time being the opposition does not have very bright prospects. 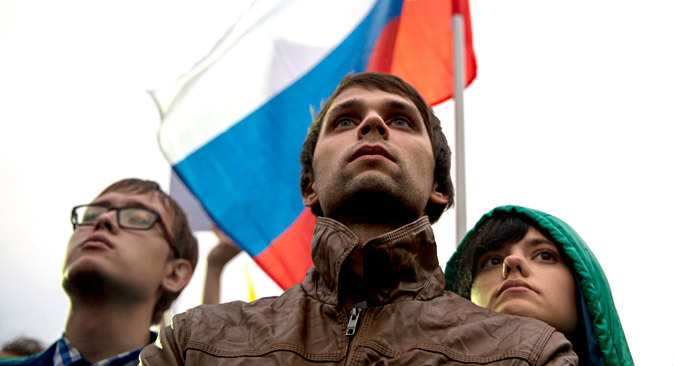 Despite claims by leading liberal figures that Russia’s opposition remains a force to be reckoned with, observers say that the increasingly low turnouts at organized protests are a sign that the movement is slipping into irrelevancy. The opposition’s latest rally, staged in a suburb of Moscow on the evening of Sept. 20 under the slogan “For the possibility to replace those in power!,” gathered from 4,000 (according to the Interior Ministry) to 7,000 participants (according to the organizers, whereas their original application was for 40,000 people), making it the second-biggest opposition protest this year. The first one was a march of mourning for opposition leader and former First Deputy Prime Minister Boris Nemtsov, assassinated in February 2015, which gathered some 16,600 people, according to official figures alone. Yet opposition leaders themselves appear to be satisfied by the turnout at the Sunday rally, with deputy chairman of PARNAS (People’s Freedom Party) Ilya Yashin telling RBTH that the attendance proved that his party was a force. The opposition agreed to the venue in the residential suburb of Maryino after their application for a venue in the center of Moscow was rejected. If previously the organizers refused to accept a suburban alternative and just canceled their plans for a rally, this time round they decided not to defend their “right to central Moscow” with a boycott. “If we do indeed have political and economic demands to the powers that be, we can declare them in Maryino too,” Alexei Navalny, the liberal opposition leader behind the rally, wrote in his blog. It is worth pointing out that the protest was held just a week after the regional and local elections, in which PARNAS got under 2 percent of the vote and did not make it to the Kostroma Region parliament. After such a “defeat”, Navalny simply could not afford “to sit it out somewhere in the shadow”, said the head of the independent Political Expert Group, Konstantin Kalachev. According to Kalachev, the opposition’s prospects are even more pessimistic if they decide to use the same slogan in the upcoming federal elections. “To fight the State Duma election under this slogan when there are 14 parties that have the right to run in elections without the need to collect signatures [a demand often used to create obstacles to parties registering for elections – RBTH] is somewhat strange. The majority of the population will not respond to it,” he said. At the same time, it would be wrong to describe both opposition projects – the regional elections and the rally – as a complete failure, says managing director of the independent Center of Political Information Alexei Mukhin, since opposition figures are again a focus of attention. “Unfortunately, they are a focus of attention mainly for foreign observers. This is slightly alarming, as it puts the opposition into the marginal zone of the notorious fifth column,” he said. Any hint that an organization receives funding from abroad is often used by the government to claim that they are “fifth columnists” operating on a shady agenda. For their part, opposition leaders do not agree that protest sentiment is waning, although they admit that the number of people who are ready to take to the streets has indeed dropped over the past several years. “After those rallies people were put in prison, prosecuted, questioned, their homes were searched. An opposition leader was assassinated. Against this backdrop, protesters have become less numerous but the number of discontented people is rising,” said Yashin.